Turkish political cartoonist Musa Kart was recently acquitted of insulting his country’s president and former prime minister Recep Tayyip Erdoğan via cartoon, but Kart says the repression of journalists in Turkey is only getting worse. 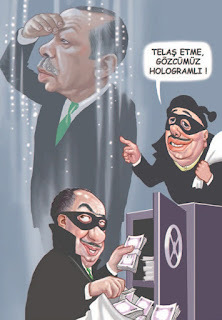 In February of this year, Kart criticized Erdoğan’s apparent role in a graft scandal and simultaneously mocked a speech that he gave via hologram at a party meeting. 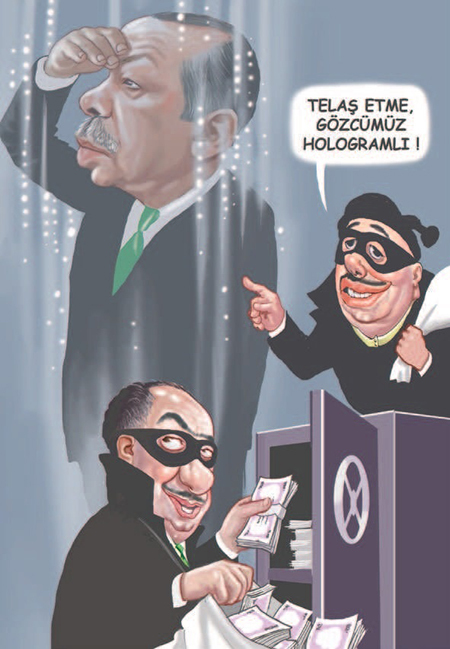 In the cartoon, Erdoğan’s digital doppelgänger stands by as one burglar counsels another: “Don’t rush, our watchman is a hologram.” In response, Erdoğan filed a criminal complaint against Kart which could have resulted in a prison sentence of nearly 10 years. This was not the first time Kart’s work ran afoul of Erdoğan’s sensibilities; in 2005 the cartoonist drew the prime minister as a cat tangled in a ball of string and was fined 5000 Turkish lira, although that verdict was later overturned. Erdoğan claimed that the cartoon caused him emotional distress. I think that we are inside a cartoon right now. Because I am in the suspect’s seat while charges were dropped against all the suspects [involved in two major graft scandals]. I need to say that this is funny. Article Source Comic Book Legal Defense Fund.